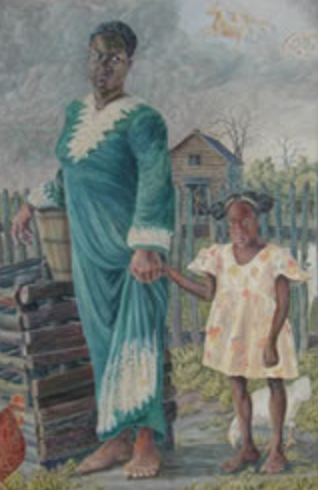 Frank Bette was a painter, sculptor, master furniture restorer, and humanitarian. After leaving his native Germany in protest of Nazism, he found his home in California where he was well loved and respected for his gentle spirit and love of art, people and justice. Siedlinghausen, Germany 1903-1927: Franz Josef Bette was born in 1903 in Siedlinghausen, Germany, where his father and his uncle had a woodturning and furniture manufacturing shop. While Frank’s schooling and apprenticeship prepared him to continue the family business his personal vision included artistic expression – something impossible in his strict family. Sponsored by his maternal uncle, F.J. Senge, Frank came to the United States in 1927 – with assurance that, if “things weren’t satisfactory”, his passage back to Germany would be paid. Chicago 1927-1942: Frank painted promotional signs for his uncle’s dry goods store and later began working with wood. He attended classes at the American Academy of Art and the Art Institute of Chicago and he joined the Chicago No-Jury Society of Artists. At that time, his work included landscapes and portraits as well as ventures into vividly colored fantasy compositions. Frank found things satisfactory. He applied for and was granted U.S. citizenship in April 1933. In 1941, his oil painting “Untitled Chicago Landscape” achieved First Mention in the Chicago Daily Times. The War Years: Frank served in the US Air Force from October 1942 to June 1945. He learned to use power tools for woodworking and was assigned to a mechanics unit to fabricate wooden propellers for trainer airplanes. Frank’s trip to the Grand Canyon in 1941 made a lasting impression. The area’s power and natural beauty became the foundation of his Grand Canyon Dance series. He began in 1942 - the Archaic Grand Canyon Dance painting was first – and, for the next 20 years, he continued painting others. New Orleans 1945 – 1951: After the war Frank relocated to New Orleans where worked in the French Quarter as a re-finisher of antique furniture. 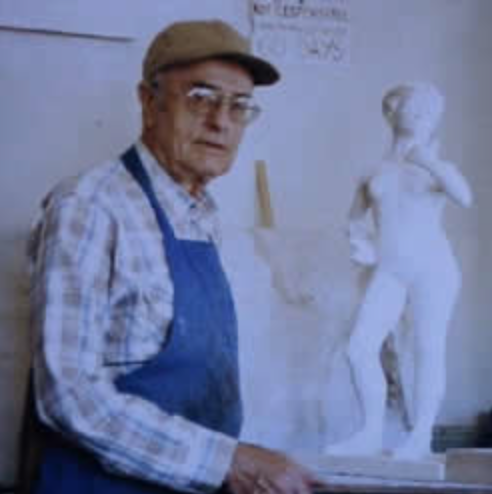 While he continued to study art and hone his skills, concentrating on sculpting plaster, stone, clay, and wood, Frank was never completely comfortable living in the South. As a European, he did not understand nor could he condone segregation. A friend suggested he might be happier living in California and, in 1949, Frank moved to San Francisco. Alameda, California 1950 – 1999: Frank’s first job was refinishing and repairing antique furniture for Gump’s in downtown San Francisco. A year later he moved to the East Bay where he re-finished and repaired antiques. An Oakland resident suggested Frank open a refinishing business in Alameda - an island city covered with Victorian houses and full of antique furniture. Frank opened his first shop on Central Avenue near Crab Cove. While business was financially tight at first, during 1952-53 he attended figure- and life-drawing classes at California College of Arts and Crafts. 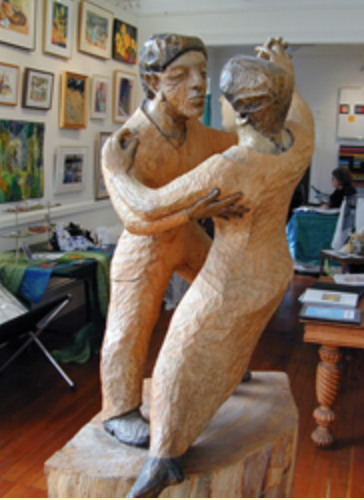 As his business prospered it allowed him the freedom to paint, draw, and sculpt. In the early 1950s he moved to the Victorian at 1601 Paru Street and lived in what is, today, the Signature Gallery while conducting business in the Main Gallery. Ten years later Frank’s landlord suggested Frank buy the building and he did just that. Nevertheless, he did not change his living arrangements; he rented out the upstairs apartment and lived simply downstairs. He ate in local restaurants or with friends and spent his free time painting en plein air. He had a particular affinity for trees and for the landscapes of Mount Diablo. Later, Frank branched into writing and concentrated particularly on poetry. Donate to the Center and keep alive Frank's legacy.